The 3B Box is an affordable monthly delivery of Asian beauty and cosmetic products. It has been a nice mixture of full and deluxe sample sizes since it's inception. Popular, along with excellent but more obscure brands, have been featured and this month is pretty stellar in that regard. It's what I consider an Asian beauty Birchbox. Relatively inexpensive and a way to get some interesting new products. Especially if you're just getting into kbeauty. 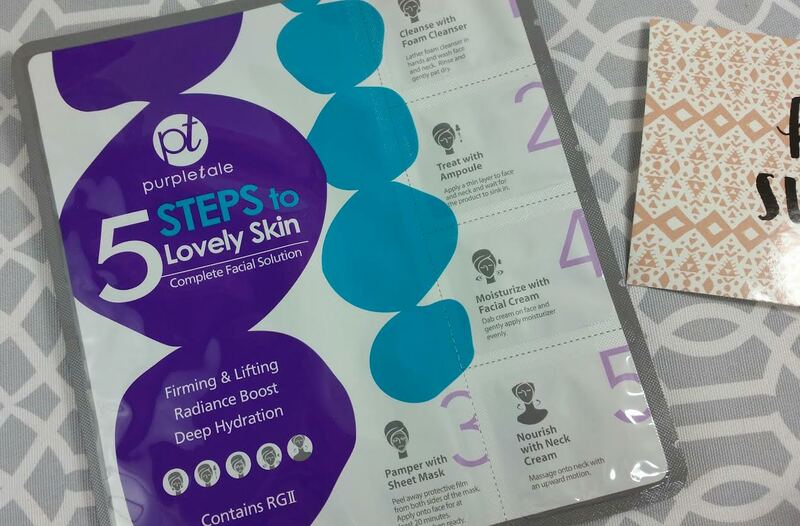 PurpleTale 5-Steps to Lovely Skin- This is fun and interesting!! This is a set that has a cleanser, ampoule, sheet mask, facial cream and neck cream. Sadly for me it has ginseng in it (my face reacts VERY poorly to ginseng) but for everyone else, it's so CUTE! 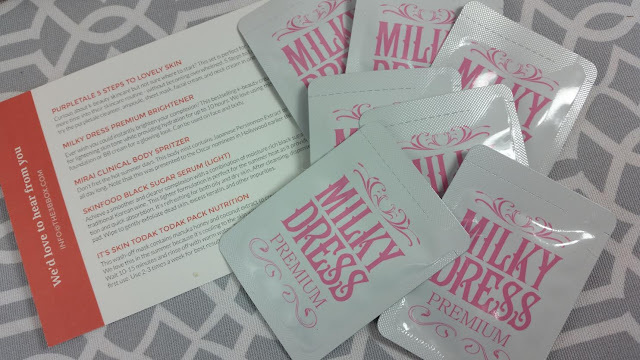 MilkyDress Premium Brightener- I first discovered this brand in Memebox (the old Memebox) and really liked the gel-cream moisurizer by MilkyDress. I haven't used this Premium Brightener, though. I think it's supposed to be used as a primer? Or maybe it's a moisturizer than *can* be used as a primer. I don't know but we'll find out. Luckily there are several foils so I can test several times. 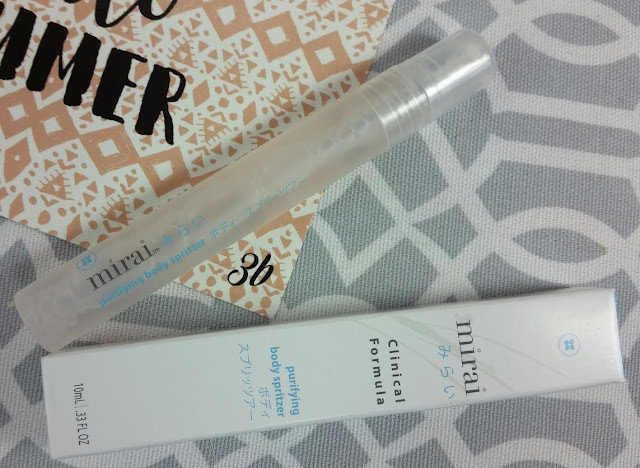 Mirai Clinical Body Spritzer- This is a body mist to keep you fresh smelling in the summer. It's from Japan and has Japanese persimmon extract in it. It says on the box that it's a deodorant and I'm not sure if that means the same thing here as it does there. Anyone know? Does it mean it's for your underarms or just generally it gets rid of odors? Either way, I'm taking this with me camping this weekend. Cuz why not!? Skinfood Black Sugar Perfect First Serum- This is a light serum moisturizer good for all skin types. 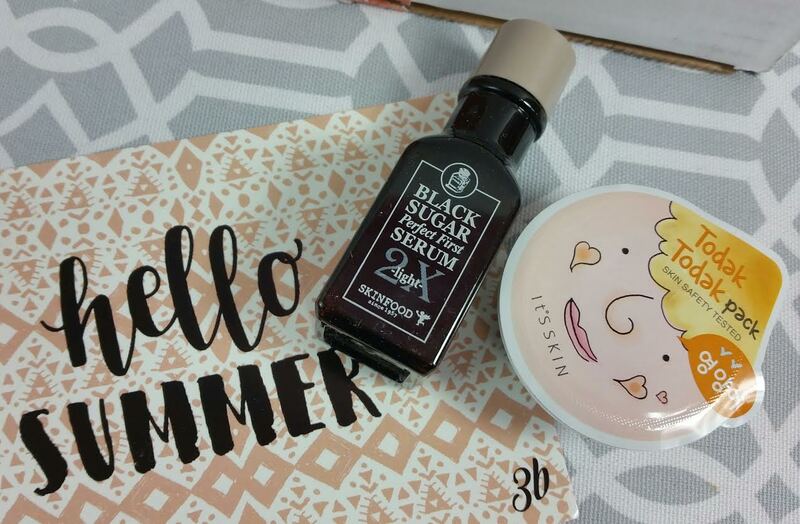 It has black sugar and wine in it and is perfect for summer skin. Serums are usually applied after you've cleansed and toned your skin. Unfortunately, based on the other version of this serum, I'm pretty sure it has alcohol in it and with my dry skin, it's better to avoid it. Bummer!! It's Skin Todak Todak Pack in Nutrition- This is a gel-type wash off mask with honey and coconut extracts. I love anything with honey and I've used the Pomegranate version of this mask and liked it. This tub has about two masks worth of product so keep that in mind. VERDICT: This was a fun box for me because it had so many things I've never tried or heard of. If I wasn't sensitive to ginseng and alcohol, I'd be over the moon with happiness with it. Yeah, there's foils. Normally I don't go for foils but when there's a large quanitity of them I'm less fussy. Plus it's very common to get a billion foils if you order anything from Korea. But the other samples are great sizes. 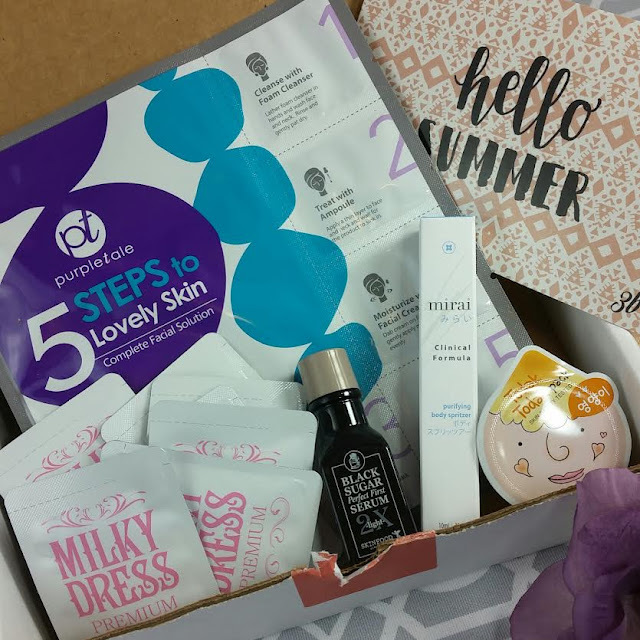 I really think that if you want to get into Asian beauty and the routines it follows, the 3B Box is a great way to do it. How have you been feeling about this box? Worth it? Not? I have to admit that I'm debating cancelling just because I've found such a good skincare routine. It's working so well, I hate to introduce anything new. On the Mirai website, it says it "eliminates body odors on the go," and "keeps you dry, and provide superior deodorant protection." It doesn't specify which part of the body it should be used on, so I guess it can be used wherever one sweats the most?